Caps and closures are an essential part of many types of packaging and containers such as bottles, jars, ampoules, canisters, tubes, stand-up pouches and beverage cartons. Their most obvious function is to open and close, and often also to reclose packaging. But depending on the application, they are also often required to have other characteristics such as barrier or protective properties. Plastic is by far the most important material for these articles of daily use, consumed in ever greater quantities, since traditional materials like aluminum, tinplate, glass or cork are increasingly replaced. Due to e.g. their low weight and versatility in regard to applications, plastics have cost and environmental advantages, facilitate handling and manufacture, improve quality and security, and offer new opportunities for packaging design. However, this is not absolutely true for all segments. In the segment wine, for example, metal closures are experiencing a more dynamic development. This study examines the market dynamics of closures made from plastics, metal (excluding can ends for beverage cans) and cork in various applications. 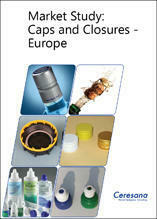 This market report also provides facts on the European caps and closures market, market trends, market size and market growth. Researchers at Ceresana expect European demand for closures to increase to approx. 460 billion units in 2021. The market for plastic caps and closures is profiting substantially from an increasing use of packaging made of plastics, of PET-based disposable bottles in particular. Rising demand for bottled water and smaller packaging sizes as well as dispensing systems will provide important stimuli to growth in the future. Plastic containers are becoming more important, not only in the segment beverages, but also in the cosmetics and pharmaceuticals industry. Often, this increase occurs at the expense of glass containers. As plastic containers are usually used in combination with a closure made of plastic, market dynamics of the two are closely correlated. Since plastics are a general purpose material and can be used in virtually all types of packaging, the plastic closures market is not as closely linked to specific packaging products as are, e.g., crown corks to the sale of beer bottles. The quality of plastics caps is improving continuously. Thus, they gain access to segments that traditionally used other materials. Examples for this trend are the subsegments beer or liquid foodstuffs such as sauces or spreads. Demographic development plays a role in some countries, in addition to an increase of unemployment rates and subsequent decline of income caused by the economic crisis that affected many industrialized countries. Moreover, governmental regulations may influence the market for certain types of beverages. Other trends such as convenience, increasing women's employment, sustainability or lightweighting also have impacts on the market for plastic containers. Demand for technically more complex closures such as tamper-evident closures and dispensers will rise in some segments in the future. Reduction of costs and weight remains a declared goal of manufacturers. On the other hand, lighter closures still have to meet the high requirements. Due to a reduction of raw material consumption and a lower transport weight, lighter closures could contribute to achieving a higher degree of sustainability. Childproof closures are also becoming more important, especially in regard to the growth market pharmaceuticals. An increasing proportion of senior citizens in several industrialized countries draws attention to aspects such as easy opening and resealing. Also, dispenser system will have to guarantee an even better dosing and handling in this regard. Metal Closures Gaining In The Segment Wine - But How About Cork? Wine closures made from cork (either one-piece or agglomerated cork) were not facing serious competition for a long time. By now, however, plastic closures were becoming more and more popular. One argument against the use of natural cork has been and is a negative effect on the wine's taste (cork taint). But cork closures came a long way in this regard. The most dynamic development at the moment (aside from specialty closures such as Vino-Lok, which are not included in this study) occurs in the segment aluminum screw caps; in addition to many other positive characteristics, they also offer high consumer convenience as no cork screws are needed to open the bottle, which can also be closed again. In some countries that are traditional large-scale producers of wine , for which specific characteristics of cork closures (e.g. exchange of oxygen) are important for afterripening, substitution of cork for plastic and metal closures proceeds much more slowly. These include Spain, Italy, France and Portugal (the key growing area of cork oaks). In other countries such as Greece and Austria, metal screw caps established themselves very quickly, leading to a rapid decline of demand for cork closures. Packaging clips, inner parts of closures, like shaker, dropper or spray inserts. Chapter 1 lists demand, production, import and export of closures for Europe as a whole as well as 21 individual countries. All numbers are in billion units. Additionally, data on import and export are further divided by the materials plastic, metal and cork. Demand for closures split by the applications lemonades, water, fruit juices, other non-alcoholic beverages, beer, wine & spirits, food, cosmetics & pharma, and other applications. Demand for plastic closures split by the applications lemonades, water, fruit juices, other non-alcoholic beverages, beer, wine & spirits, food, cosmetics & pharma, and other applications. Demand for metal closures split by the applications lemonades, water, fruit juices, other non-alcoholic beverages, beer, wine & spirits, food, and cosmetics, pharma & other applications [sic]. Demand for cork closures split by the applications wine & spirits, food and, if applicable, other applications. Chapter 2 provides a substantiated analysis of individual applications for closures: Data on demand development in the segments lemonades, water, fruit juices, other non-alcoholic beverages, beer, wine & spirits, food and cosmetics & pharma as well as other applications for 21 European countries is given. Chapter 3 clearly illustrates demand for individual materials (plastics, metal, and cork), split by 21 European countries. Chapter 4 provides profiles of the largest manufacturers, clearly arranged according to contact details, turnover, profit, product range, production sites and profile summary. Extensive profiles of 85 manufacturers are provided, including ALPLA Werke Alwin Lehner GmbH & Co KG, Amcor Flexibles Europe & Americas, Aptar Group, Berry Plastics Corporation, Crown Holdings, DS Smith PLC, Inc., Gerresheimer AG, Hoffman Neopac AG, Huhtamaki Oyi, MeadWestvaco, Rexam Plc, Reynolds Group, Riwisa AG, RPC Group Plc, Silgan Holdings.